In 1921, the Peace Silver Dollar coins officially went through its first year of production in the United States of America. What makes this first series of these Peace Silver Dollars unique is that they were struck in high relief, which made these silver coins difficult to strike during production, leading to excessive die breakage. These issues were resolved after they improved production by striking these coins at lower pressures. Due to the early production issue, you will notice that many of the coins from this year will lack some fine details at the center of the coins. The Philadelphia mint produced just over 1 million Peace Dollar silver coins by the end of December 1921 and released into circulation for the American public. Many collectors value this mint because its the first original year of its production. 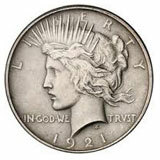 If you want to make a good investment in your coin collection, we suggest that you collect Peace silver dollar coins. We have located some good bargains and deals online if you are looking to purchase and collect this mint.